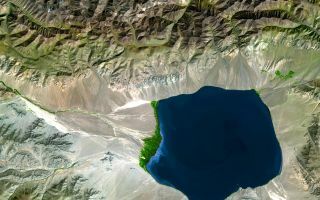 The Uvs Nuur Basin in Mongolia and the Russian Federation is the northernmost of the enclosed basins of Central Asia. This cool space wallpaper shows The Uvs Nuur Basin in Mongolia and the Russian Federation is the northernmost of the enclosed basins of Central Asia. It takes its name from Uvs Nuur Lake, a large, shallow and very saline lake, very important for migrating birds. Inscribed as a UNESCO World Heritage Site in 2003, the site is made up of twelve protected areas representing major biomes of eastern Eurasia.